Serving the north of England and wider areas for larger yards. 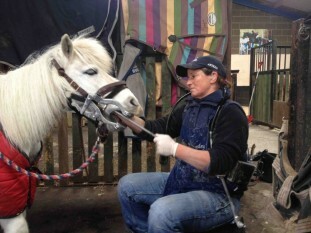 Sally is unique as a northern vet in holding both American and UK equine dental qualifications. She offers a proactive approach for optimum oral health. A comfortable and well functioning mouth will encourage happy horse-rider communication. Using the latest techniques combined with a wealth of experience and trained both in the Uk and abroad, you can be confident your horsre is receiving thorough, quality care. Sally's own riding experience,, and understanding of equine anatomy mean she can help you with riding issues that may be due to discomfort in your horse's mouth. With over a decade specialising in this field, and a sympathetic and sensible approach, we can take care of your horse’s total dental needs.